Peer Education & Chemical Health - Welcome! Monday through Friday 8 am - 4:45 p.m. The Peer Assistants are available as resources to help you with any issues that may arise. If we are unable to assist you, we will direct you to other on-campus or off-campus professionals. Come hang out in the Peer Education Office where you can relax on the couch, do homework at the large table, meet friends and have a cup of tea or coffee. If you’d like to meet with a specific PA, please contact them using their individual email in “Meet the PAs." 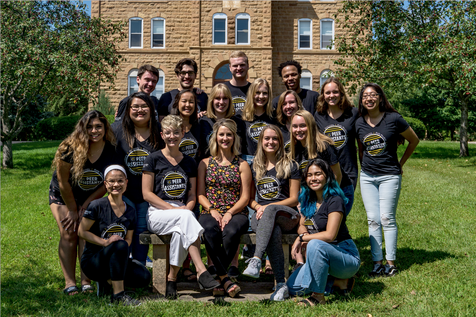 The Peer Education & Chemical Health Office, with help from the Peer Assistants (PAs), is dedicated to promoting well-being by providing quality wellness education and resources that support and enhance the lifestyles of our students. Our focus areas include: Chemical Health, Mental Health & Stress Management, Sexual Health, Sleep, and Nutrition & Physical Activity. PAs are available for conversation Monday-Friday. Interested in being in a Peer Assistant? Submit an APPLICATION to the Peer Ed Office by Friday, February 22nd, 2019.